Extreme convergence in the body plans of an early suchian (Archosauria) and ornithomimid dinosaurs (Theropoda). 2006. Sterling J. Nesbitt and Mark A. Norell. Proceedings of the Royal Society B. Published on-line Jan. 25. Abstract: Living archosaurs comprise birds (dinosaurs) and crocodylians (suchians). The morphological diversity of birds and stem group dinosaurs is tremendous and well-documented. Suchia, the archosaurian group including crocodylians, is generally considered more conservative. Here, we report a new Late Triassic suchian archosaur with unusual, highly specialized features that are convergent with ornithomimid dinosaurs. 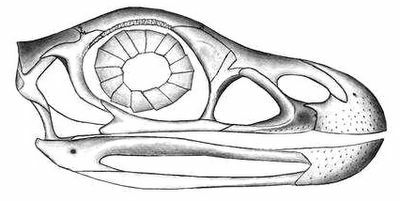 Several derived features of the skull and postcranial skeleton are identical to conditions in ornithomimids. Such cases of extreme convergence in multiple regions of the skeleton in two distantly related vertebrate taxa are rare. This suggests that these archosaurs show iterative patterns of morphological evolution. It also suggests that this group of suchians occupied the adaptive zone that was occupied by ornithomimosaurs later in the Mesozoic. A toothless, two-legged crocodile ancestor that walked upright and had a beak instead of teeth was discovered in the basement of New York's American Museum of Natural History, according to a report published on Wednesday. The 210 million-year-old fossil had sat in storage at the museum for nearly 60 years and was found only by accident, the paleontologists said. The 2 meter long archosaur is interesting because it closely resembles a completely unrelated dinosaur called an ostrich dinosaur that lived 80 million years later. Its skull and skeleton were very similar to those of ostrich dinosaurs, with a beak, a long tail, and two-legged stance. Its ankle, however, shows its relationship to crocodilians. It was discovered in blocks of rock from the Ghost Ranch Quarry, New Mexico that were excavated in 1947 and 1948. Scientists thought that all the specimens were Coelophysis, a small, carnivorous dinosaur that lived at the same time. Norell and Sterling Nesbitt named the new animal Effigia okeeffeae. The name recalls both the ranch and painter Georgia O'Keefe, who had an interest in the quarry. What Does 'I.D.' Stand For?